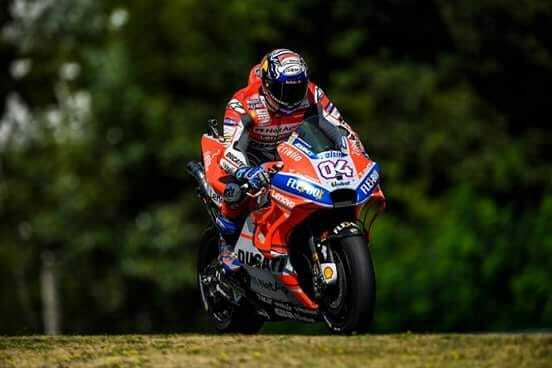 Andrea Dovizioso (Ducati Team) came out firing on all cylinders in FP2 to go fastest overall on day one, with home hero Cal Crutchlow (LCR Honda Castrol) just 0.005 off the Italian’s 2:01.358 in second. Maverick Vinales (Movistar Yamaha MotoGP) had a very strong opening day. He got within 0.061 of Dovizioso in FP2 to end the day third quickest after topping FP1. The threat of rain was in the air but it held off as the premier class got an all-important dry Friday Free Practice. He ended the opening day 0.144 from the top. Rounding out the top five was Jorge Lorenzo (Ducati Team), squeezing into an automatic Q2 spot on his final lap. The Austrian GP winner lingered down in P17 with the clock ticking. After finishing FP1 in fifth, Jack Miller (Alma Pramac Racing) continued to rediscover his early season speed to end Friday sixth fastest overall. He is less than half a second behind fellow Ducati man Dovizioso. Johann Zarco (Monster Yamaha Tech 3) managed to grab a top ten position in seventh at the end of FP2, the Frenchman jumping up two positions from his P9 in the morning, with Valentino Rossi (Movistar Yamaha MotoGP) eighth quickest overall after finishing FP1 in second. The Doctor is looking like he can have a very positive weekend after topping the session at times. Fellow Italian Andrea Iannone (Team Suzuki Ecstar) consolidated at top ten in FP2 to finish ninth quickest. While Alvaro Bautista (Angel Nieto Team) sitting in the final provisional automatic Q2 spot in tenth, improving from P11 in FP1. The battle of Britain looks set to be a classic after Friday’s track action. 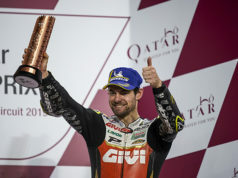 Ducati, Yamaha and Crutchlow all looking good to take the fight to Marquez this weekend. The premier class have another chance to book their place in Q2 on Saturday morning. 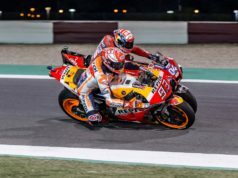 A big names such as Danilo Petrucci, Dani Pedrosa and Alex Rins all aiming to get into the top ten. Tito Rabat (Reale Avintia Racing) crashed at the fast Farm Curve. The rider is fine.